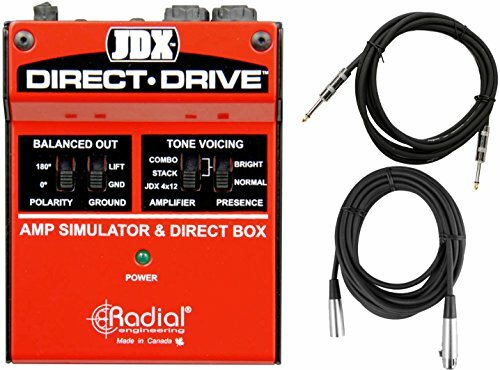 The RadialTM JDX Direct-Drive is a unique and powerful device that emulates the sound of a guitar amplifier while doubling as a direct box. Unlike a typical direct box that merely transfers the sound of the pedals to the PA, the Direct-Drive simulates the tone and feel of a real guitar amp, producing a much more realistic sound. In other words, with the Direct-Drive on your pedalboard, you can do a gig without carrying an amp to the club. The design begins with a traditional ¼" guitar input and passive thru-put to feed a stage amp. This is then followed by a dedicated tuner output that is buffered in order to eliminate loading on the pickup or noise from the quartz clock. The guitar signal is then passed through a series of carefully sculpted filters to create Radial's signature JDX tone. This is modelled after the sound of a Shure SM57TM in front of a MarshallTM 4x12 cabinet. The Direct-Drive goes further with two more voicing settings: the first adds a vintage MarshallTM tube head character to the signal path while the second delivers a tone reminiscent of an early Fender TwinTM. The two amp tones can be further tailored using a presence switch for extra sparkle. The guitar signal exits the Direct-Drive via either a ¼" guitar-level output or via a balanced XLR to feed the PA. The direct box output is outfitted with a 180° polarity reverse switch to help phase-align monitors with the stage amp along with a ground lift switch to help eliminate hum and buzz caused by ground loops. The Direct-Drive may be powered using a standard 9V power supply or typical pedalboard power brick. As with all Radial products, the Direct-Drive is made to handle the rigors of professional touring with 14-gauge steel throughout. This not only helps prevent damage to the internal PCB, it also reduces susceptibility to noise from external magnetic fields. Includes a 18' Instrument Cable and 20' XLR Cable!